But wait (cue infomercial visual effects)! What if you could use repurpose your content and get it on at least 100 million devices? I am talking about Amazon Alexa devices. Why Alexa, and not Google Assistant or Siri? These are voice apps for Alexa enabled devices, and ever since Amazon rolled out the Skills store, developers have so far built more than 70, 000 skills. Some of these Skills update you on news, others tell stories, order a pizza or an Uber, or play Jeopardy, among other things. But you still had to know how to code to built a Skill. 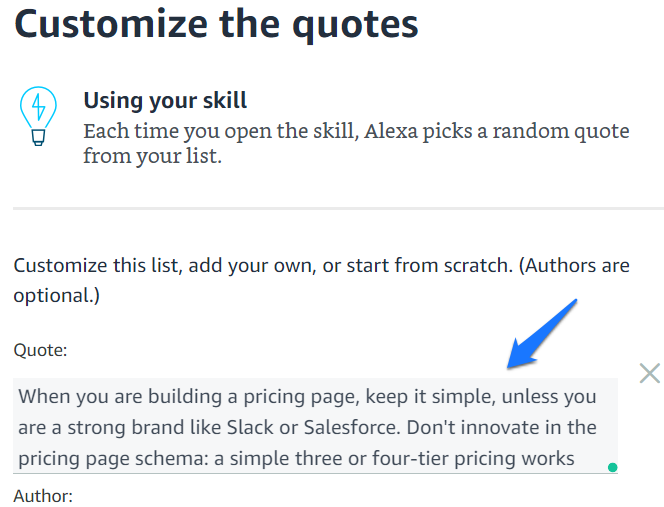 That changed in Feb 2019 when Amazon released Alexa Skill Blueprints. Think of these Blueprints as templates. You just have to customize the content, work through an user friendly wizard and voila! 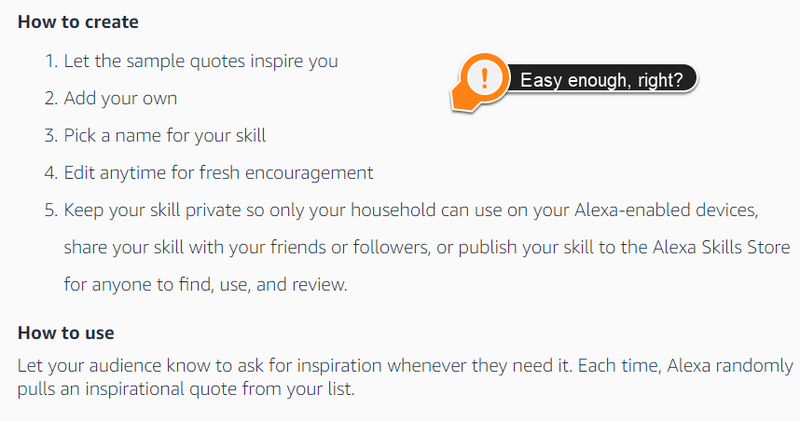 You have a sparkling new Alexa Skill, which you can either publish so that anyone can use it, or keep it for your own use. You don’t have to pay Amazon anything for it, and all you need is an Amazon account. What kind of Skills could you create with the more than 30 Blueprints currently available? Authors, leaders and motivational speakers can put selected quotes from their books and speeches for listeners. Gyms, fitness trainers and coaches can create customized routines that their clients can listen along as they work out. Brands can create quizzes and trivia contests around their product/service offerings, improving engagement with content. Companies can onboard and train new employees through flashcards. A boring case study or a whitepaper can become an interactive story. Make a ho-hum training session come alive with a game show. Get stock quotes, news updates, and fresh content as a flash briefing. As more Blueprints are added, there will be more opportunities for your customers and users to engage with your content. Right now, you can’t connect the Skills you built using Blueprints to order flowers or an Uber without some coding. The Blueprints on offer, which span categories like Greetings and Occasions, Communities and Organizations, Fun and Games, Learning and Knowledge, At Home and Storyteller will give you plenty of things to play with. So lets build our first Skill, shall we? I picked out the Inspiration Blueprint to use in my first skill. With this Blueprint, you can build a skill where Alexa will play back any content you have added. While it is built for motivational quotes, its use cases come into play any time you need to deliver bite-sized content to listeners. I chose SaaStr founder, VC and ex CEO of Adobe EchoSign Jason Lemkin’s Quora answers, because I have learned a lot from him on B2B SaaS, and they are wildly popular among SaaS practitioners. Each Blueprint has its own multi step process. For the Inspiration Blueprint, here’s how the entire process starts. After you have clicked on the Inspirations Blueprint, you will get to the overview page where you can understand how the Blueprints work. Click on the Make Your Own button at the top, and start adding your content. For my Skill, I broke down Jason’s answers into 2-3 sentences each and added them as a single quote. When you are creating these quotes make sure that the language is short and conversational. These quotes are designed to be read out. Once you have added the content, click on the Name button at the top right of your screen, and give it a unique, easy to pronounce and memorable name. Because of the way Alexa works, there are some restrictions on the name. If your name sounds complex, the wizard will ask you to replace it with something similar. 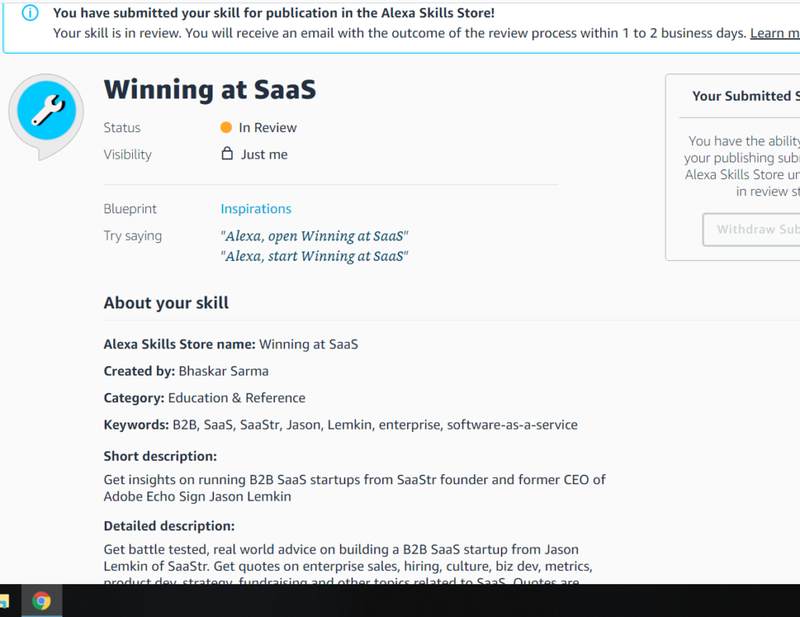 After multiple tries, I settled on “Winning at SaaS”. Choose a category from a drop down list, and add some keywords for your Skill. Add a short description of your Skill, along with a longer description. Using keywords in the description can presumably help you with search, though I have not yet tested it out. You can also upload a custom icon, or use the built in tool to create one. Once you are done with housekeeping, you can start testing your Skill. The easiest way to test it is by using an Echo device. However, if you don’t have an Echo device like me, you can use this online Echo simulator to test your skill. It doesn’t work always and sometimes quite slow, but my tests have come out pretty positive over time. After testing, you can immediately start using it, either on your own device, or sharing it with other people. 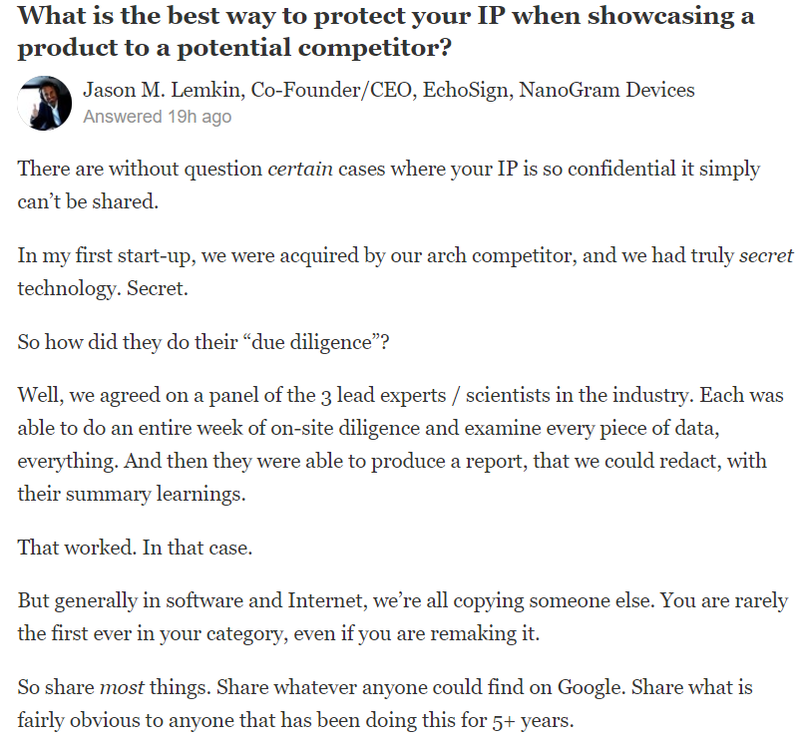 If you share the skill privately, you can’t publish it until your revoke the Share permissions. 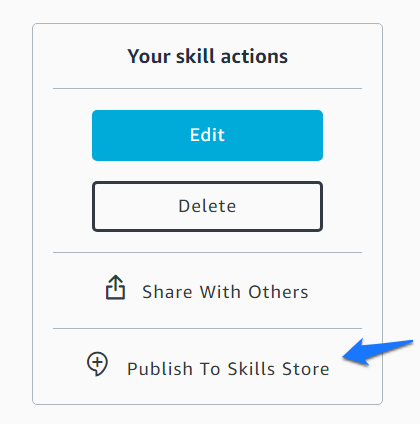 Once you hit the publish button, the skill will go into the review queue, At this point, only you have access to the skill. For certain Blueprints you also have to certify whether the skill is meant for children under 13, to comply with COPPA regulations. You will have to certify whether advertising is included in the skill. 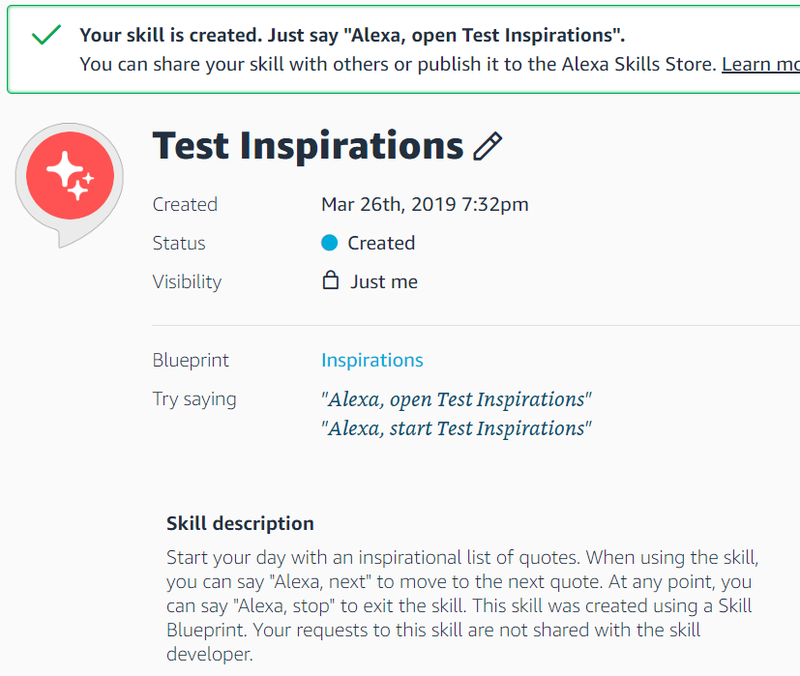 My Alexa skill was published after a day, and you can check it out on the Alexa Skills store. Like app store optimization, the more reviews and ratings your skill gets the higher it will appear in search results. Much like an app, you are going to have to add more content to your skill so that listeners get more value as they listen through the quotes. For this app, I will have to add quotes over time so that Alexa keeps on serving up fresh content. 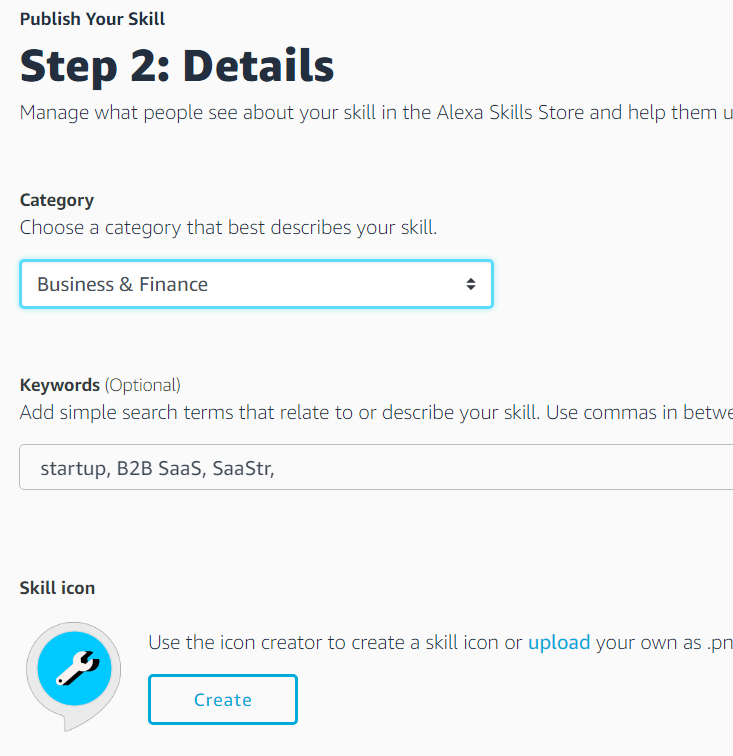 You can do more by going to the Alexa Developer Console and monetize it (right now, you can monetize skills only for US). You can sell premium content, one time consumables, and subscriptions through your skill. This page has more details on how to monetize your skills through the command line. I am going to be posting another post later detailing my experiments with monetizing a skill. So, what are you waiting for? Go explore, build, and show off your Alexa skill. You don’t have to code a single line. Your content will get more exposure, your brand will get heard by a whole new demographic, and with a smart strategy, you will become a part of your customer’s daily routine.